Blogging functionality allows document users and readers to post comments to individual KnowledgeBase (KB) documents. Please note that blogging works *only on* internal sites/documents. Blogging can be turned on at the document level. Blogging is disabled at the document level by default. Blogging is available only on Internal sites. 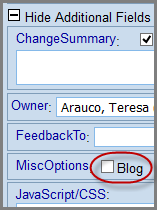 To turn blogging on for an individual document check the Blog checkbox under MiscOptions in the Additional Fields section in the document editor. To read or post a comment to a KB Document scroll to the bottom of the document. If blogging is enabled for this document the Discussion box will be displayed and any posts will be displayed below the Discussion box. Enter post (your thoughts, feedback, and comments) regarding a KB document in the Discussion text box at the bottom of any document with blogging enabled. Posts are displayed in reverse chronological order (most recent post displays at the top of the section). Any URLs included in a post will be converted to HTML links. All other html is ignored. Posts can be edited by the owner of the post. Posts can be deleted by the moderator (KB Administrators with "Publish" rights). The delete button will only appear for the moderator. The Delete button will hide the post; it will not delete the post from the database. Posts can be replied to. The text of the original post will be appended below a dashed (- - - - - - - - - - - ) line.